One of the goals for the Minneapolis Promise Zone (MPZ) initiative is to enable North Minneapolis resident to thrive in their own communities without having to go elsewhere for employment and amenities. An analysis of the inflow and outflow of MPZ employment data shows the work has only just begun: There are only 813 MPZ residents that both live and work their communities. The inflow (10,130) represents employees that work within the MPZ, but are not residents of the community. 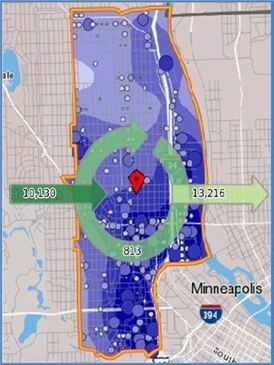 The outflow, (13,216) represents the residents of the MPZ that leave their communities to work outside of the MPZ. Overall, there are almost 11,000 existing jobs in the MPZ; however, 10,000 of the jobs are filled by non-residents. The Cookie Cart of North Minneapolis is expanding to St. Paul. The nonprofit employs up to 200 teenagers annually through training, financial-and-career classes, and part-time jobs of up to 30 hours weekly. A few years ago, people might have laughed at the prospect of a 2017 North High graduating class. Yet these graduating seniors and their families became part of the turnaround story for one of the city's most challenged high schools. The Breaking Bread Cafe on West Broadway in North Minneapolis is that specialist sit-down place that serves comfort food with a home-away-from-home kind of atmosphere. The message to stop all gun violence was made clear at a Minneapolis park on Saturday. People are wearing orange and calling for an end to violence after recent shootings. Several organizations gathered in North Commons Park, asking elected officials to pass sensible gun laws. Community activists - including a Vice Lords leader who spent more than two decades in prison - say they will hold a peace conference next month in north Minneapolis to reach out to young people and discourage them from engaging in violence. With an emphasis on two-year colleges, the Advanced Technological Education (ATE) program focuses on the education of technicians for the high-technology fields that drive our nation's economy. The program involves partnerships between academic institutions and industry to promote improvement in the education of science and engineering technicians at the undergraduate and secondary school levels. The ATE program supports curriculum development; professional development of college faculty and secondary school teachers; career pathways; and other activities. The program invites research proposals that advance the knowledge base related to technician education. It is expected that projects be faculty driven and that courses and programs are credit bearing although materials developed may also be used for incumbent worker education. The ATE program encourages partnerships with other entities that may impact technician education. The ATE program encourages proposals from Minority Serving Institutions and other institutions that support the recruitment, retention, and completion of students underrepresented in STEM in technician education programs that award associate degrees. NSF is particularly interested in proposals from all types of Minority Serving Institutions (including Hispanic Serving Institutions, Historically Black Colleges and Universities, Tribal Colleges and Universities, and Alaska Native and Native Hawaiian Serving Institutions) where the proportion of underrepresented students interested in advanced technology careers is growing. The Institute's purpose in awarding these grants is to provide national leadership in expanding fundamental knowledge and understanding of (1) developmental and school readiness outcomes for infants and toddlers with or at risk for a disability, and (2) education outcomes for all students from early childhood education through postsecondary and adult education. The Institute's research grant programs are designed to provide interested individuals and the general public with reliable and valid information about education practices that support learning and improve academic achievement and access to education opportunities for all students. These interested individuals include parents, educators, students, researchers, and policymakers. In carrying out its grant programs, the Institute provides support for programs of research in areas of demonstrated national need. The Media Projects program supports film, television, and radio projects that engage general audiences with humanities ideas in creative and appealing ways. All projects must be grounded in humanities scholarship in disciplines such as history, art history, film studies, literature, drama, religious studies, philosophy, or anthropology. Projects must also demonstrate an approach that is thoughtful, balanced, and analytical (rather than celebratory). The approach to the subject matter must go beyond the mere presentation of factual information to explore its larger significance and stimulate critical thinking. NEH is a national funding agency, so the projects that we support must demonstrate the potential to attract a broad general audience. Film and television projects may be single programs or a series addressing significant figures, events, or ideas. Programs must be intended for national distribution, via traditional carriage or online distribution. The Division of Public Programs welcomes projects that range in length from short-form to broadcast-length video. The Division of Public Programs also encourages film and television projects that examine international themes and subjects in the humanities, in order to spark Americans’ engagement with the broader world beyond the United States. These projects should demonstrate international collaboration by enlisting scholars based both in the United States and abroad, and/or by working with an international media team. The collaborations should bring broad cross-cultural perspectives to the proposed topics and should be intended primarily for U.S. public audiences. Radio projects, including podcasts, may involve single programs, limited series, or segments within an ongoing series. They may also develop new humanities content to augment existing radio programming or add greater historical background or humanities analysis to the subjects of existing programs. Programs receiving production grants may be either broadcast or disseminated online. They may be intended for national or regional distribution. NEH encourages projects that engage public audiences through multiple formats in the exploration of humanities ideas. Proposed projects might include complementary components to a film, television, or radio project. These components should deepen the audience’s understanding of the subject in a supplementary manner: for example, book/film discussion programs, supplemental educational websites, or museum exhibitions. Development grants enable media producers to collaborate with scholars to develop humanities content and to prepare programs for production. Grants should result in a script and may also yield a detailed plan for outreach and public engagement in collaboration with a partner organization or organizations. See application guidelines for Development Grants. Production grants support the production and distribution of films, television programs, and radio programs or podcasts that promise to engage a broad public audience. Development grants enable media producers to collaborate with scholars to develop humanities content and to prepare programs for production. Grants should result in a script and may also yield a detailed plan for outreach and public engagement in collaboration with a partner organization or organizations. See application guidelines for Development Grants. Production grants support the production and distribution of films, television programs, and radio programs or podcasts that promise to engage a broad public audience. Development grants enable media producers to collaborate with scholars to develop humanities content and to prepare programs for production. Grants should result in a script and may also yield a detailed plan for outreach and public engagement in collaboration with a partner organization or organizations. Production grants support the production and distribution of films, television programs, and radio programs or podcasts that promise to engage a broad public audience. The National Historical Publications and Records Commission seeks projects that ensure online public discovery and use of historical records collections. All types of historical records are eligible, including documents, photographs, born-digital records, and analog audio and moving images. Projects may preserve and process historical records to: • Create new online Finding Aids to collections • Digitize historical records collections and make them freely available online The NHPRC encourages organizations to actively engage the public in the work of the project. For a comprehensive list of Commission limitations on funding, please see: "What we do and do not fund" (http://www.archives.gov/nhprc/apply/eligibility.html). Applications that consist entirely of ineligible activities will not be considered. Award Information A grant is for one or two years and for up to $100,000. The Commission expects to make up to 10 grants in this category for a total of up to $700,000. Grants begin no earlier than July 1, 2018. The Commission requires that grant recipients acknowledge NHPRC grant assistance in all publicity, publications, and other products that result from its support. Public Humanities Projects grants support projects that bring the ideas and insights of the humanities to life for general audiences. Projects must engage humanities scholarship to analyze significant themes in disciplines such as history, literature, ethics, and art history, or to address challenging issues in contemporary life. NEH encourages projects that involve members of the public in collaboration with humanities scholars or that invite contributions from the community in the development and delivery of humanities programming. This grant program supports a variety of forms of audience engagement. Applications should follow the parameters set out below for one of the following three formats: • Community Conversations: This format supports one- to two-year-long series of community-wide public discussions that bring together a diverse group of residents to address important topics relevant to their town or city, guided by the perspectives of the humanities. Applicants must demonstrate prior experience conducting public and nonpartisan dialogues about important topics. • Exhibitions: This format supports permanent exhibitions that will be on view for at least three years, or travelling exhibitions that will be available to public audiences in at least two venues in the United States (including the originating location). • Historic Places: This format supports the interpretation of historic sites, houses, neighborhoods, and regions, which might include living history presentations, guided tours, exhibitions, and public programs. NEH encourages projects that explore humanities ideas through multiple formats. Proposed projects may include complementary components: for example, a museum exhibition might be accompanied by a website, mobile app, or discussion programs. Your application must identify one primary format for your project and follow the application instructions for that format. Grants for Fellowship Programs at Independent Research Institutions (FPIRI) support fellowships at institutions devoted to advanced study and research in the humanities. Recognizing that at times scholars need to work away from their homes and institutions, the FPIRI program sponsors fellowships that provide scholars with research time, a stimulating intellectual environment, and access to resources that might otherwise not be available to them. Fellowship programs may be administered by independent centers for advanced study, libraries, and museums in the United States; American overseas research centers; and American organizations that have expertise in promoting research in foreign countries. Individual scholars apply directly to the institutions for fellowships. In evaluating applications consideration is given to the library holdings, archives, special collections, and other resources—either on site or nearby—that institutions make available to fellows. FPIRI grants provide funding for humanities fellowships of four to twelve months. The fellowships are held at the U.S. grantee institutions or—in the case of overseas research centers and organizations—abroad. FPIRI grants support fellowship stipends at a rate of $4,200 per month and a portion of the costs of selecting the fellows, up to $5,000 per year. The Administration for Children and Families, Office of Refugee Resettlement invites the submission of applications for funding under the Ethnic Community Self-Help (ECSH) Program. The goal of this program is to support Ethnic Community-Based Organizations (ECBOs) in providing refugee populations with critical services to assist them in becoming integrated members of American society. Under the ECSH Program, the following three main objectives must be implemented: 1) to strengthen ECBOs provision of culturally and linguistically appropriate services to refugees within five years after their initial resettlement; 2) to support ECBOs organizational development and engagement in capacity building by encouraging their collaboration with established refugee service providers and mainstream organizations; and 3) to support ECBOs in promoting community building and civic participation by refugee individuals and refugee community members. The Substance Abuse and Mental Health Services Administration (SAMHSA), Center for Substance Abuse Prevention (CSAP), is accepting applications for fiscal year (FY) 2017 First Responders-Comprehensive Addiction and Recovery Act (FR-CARA) Cooperative Agreements. SAMHSA will award FR-CARA funds to states, tribes and tribal organizations, and local governmental entities. Local governmental entities include, but are not limited to, municipal corporations, counties, cities, boroughs, incorporated towns, and townships. The purpose of this program is to allow first responders and members of other key community sectors to administer a drug or device approved or cleared under the Federal Food, Drug, and Cosmetic Act for emergency treatment of known or suspected opioid overdose. Grantees will train and provide resources to first responders and members of other key community sectors at the state, tribal, and local governmental levels on carrying and administering a drug or device approved or cleared under the Federal Food, Drug, and Cosmetic Act for emergency treatment of known or suspected opioid overdose. Grantees will also establish processes, protocols, and mechanisms for referral to appropriate treatment and recovery communities. The purpose of this forecasted funding opportunity announcement (FOA) is to provide competitive grant funds for up to 5 years for projects authorized by the Child and Family Services Improvement and Innovation Act (Pub. L. 112-34). This Act includes a targeted grants program (section 437(f)) that directs the Secretary of Health and Human Services to reserve funds for regional partnership grants (RPGs) to improve the well-being of children affected by substance abuse. These targeted grants will be awarded to regional partnerships that provide, through interagency collaboration and integration of programs and services, activities and services that are designed to increase the well-being of, improve permanency outcomes for, and enhance the safety of children who are in out-of-home placements or are at risk of entering out-of-home placements as a result of a parent's or caretaker's substance abuse. Applicants will be expected to have a collaborative structure in place that is capable of building the region's capacity to meet a broad range of needs for families involved with both substance abuse treatment and the child welfare system. This funding opportunity is for competitive grants to be awarded under the OAA Title IV authority to increase the evidenced based knowledge base of nutrition providers, drive improved health outcomes for program recipients by promoting higher service quality, and increase program efficiency through innovative nutrition service delivery models. Funding will support innovative and promising practices that move the aging network towards evidenced based practices that enhance the quality, effectiveness of nutrition services programs or outcomes within the aging services network. Innovation can include service products that appeal to caregivers (such as web-based ordering systems and carryout food products), increased involvement of volunteers (such as retired chefs), consideration of eating habits and choice (such as variable meal times, salad bars, or more fresh fruits and vegetables), new service models (testing variations and hybrid strategies) and other innovations to better serve a generation of consumers whose needs and preferences are different. Innovation and promising practices may include the testing and publishing of positive outcomes in which nutrition programs provide a meaningful role in support of the health and long-term care of older individuals. Outcomes should focus on methods to improve collaboration with local health care entities, decrease health care costs for a specific population or decrease the incidence of the need for institutionalization among older adults. Through this program, funds may be used to help develop and test additional models or to replicate models that have already been tested in other community-based settings. This notice solicits applications for the ECI program. The ECI program is intended to provide support for minority and/or disadvantaged communities disproportionately impacted by the opioid epidemic, childhood/adolescent obesity, or serious mental illness. It seeks to prevent opioid abuse, increase access to opioid treatment and recovery services, and reduce the health consequences of opioid abuse; reduce obesity prevalence and disparities in weight status among children and adolescents; and reduce the impact of serious mental illness and improve screening for serious mental illness at the primary care level. The ECI seeks to demonstrate the effectiveness of collaborations that include academic medical centers, prevention research centers, teaching hospitals, or Tribal epidemiology centers, and community based organizations to reduce significant health disparities impacting minorities and disadvantaged populations through the implementation of evidence-based interventions and promising practices with the greatest potential for impact. OMH anticipates funding up to 16 cooperative agreements for $300,000 to $350,000 each for approximately $5 million total, for a one-year period of performance, for a project period of three years. Each application should address only one of the three focus areas of the ECI program: opioid abuse; childhood/adolescent obesity; or serious mental illness. The purpose of the Elder Justice Innovation Grants program is to support the development and advancement of new and emerging issues related to elder justice. Funded projects will contribute to the improvement of the field of elder abuse prevention and intervention at large, such as by developing materials, programs, etc. that can be widely disseminated and/or replicated, or by establishing and/or contributing to the evidence-base of knowledge. For FY 2017, funded projects will continue to build the evidence-base on successful approaches to reduce and ameliorate the harm people experience as a result of abuse, neglect, and financial exploitation, and to better understand what adult protective services practices produce the best outcomes.